Maus I – A Survivor’s Tale: My Father Bleeds History by Art Spiegelman is an award winning graphic novel published in 1986. In this book, Spiegelman retold the story of his father, Vladek Spiegelman, a Polish Jew who survived Nazi’s viciousness during the Holocaust. In Maus I, Spiegelman represented different race with certain animal, although they still have human-shaped body. Jews were presented as mice, Germans and Polish were presented as Cats and Pigs. It has drawn vast academic attention in the English-speaking world and it became the 1st graphic novel that won a Pulitzer Prize (1992, Special Award in Letters). 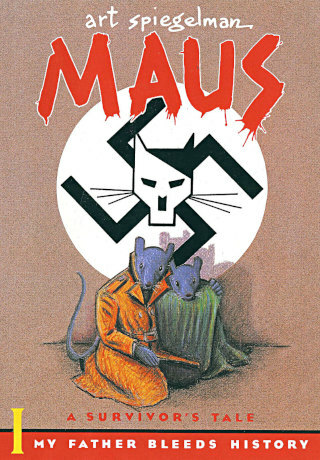 As reflected in the title, Maus I – A Survivor’s Tale: My Father Bleeds History, the graphic novel pictured how Art Spiegelman retraced the history of his father, Vladek Spiegelman. From many interviews with his father, Art recaptured and recounted, in cartoon, the terrifying facts in his father experience and in history itself during Hitler madness in Europe. The book interweaves two great story lines from two different periods. The first one is Vladek Spiegelman’s harrowing narrative about how he and his wife survived Nazi, which was full of numerous brushes with death, improbable escapes, and the terror of confinement and betrayal. The second story is the Art strenuous relationship with his old father as both of them tried to have a normal life. * You can read Maus II graphic novel here.